Applications are open for this year’s edition which will run from 5th August- 20th September 2013. We therefore kindly request you to share this information within your networks and encourage all interested young people to apply for this great opportunity. Applications will close on 30th June, 2013. The Commonwealth Youth Programme is calling for applications to the 2013 edition of the Discovering Young Leaders Programme (DYLP). DYLP is designed as an online interactive leadership training programme for youth leaders. The main aim is to empower young leaders by developing their leadership skills and tapping into their hidden potential through online discussions and assignments. It introduces them to the Commonwealth’s concepts, principles, values and practices in youth development. It serves as an opportunity for exchange of ideas, thoughts, experiences and best practice pertaining to youth leadership between young leaders and an array of eminent persons from the youth development and leadership sector including globally renowned youth development consultants, Ministers, Permanent Secretaries, and leaders of International Youth development organisations, NGOs, and the civil society as well as the private and public sectors. DYLP was introduced by the Commonwealth Youth Programme (CYP) in 2012 to strengthen the leadership capabilities of young leaders through intergenerational dialogue and peer-learning. More than 250 young leaders from 39 countries participated in the inaugural edition of DYLP out of which 117 participants successfully completed the 5 week programme and were awarded with a Certificate. This edition will feature 500 young leaders selected from among other, National Youth Councils, Award leaders and participants of the Duke of Edinburgh’s International Award, members of the Scouts’ Movement, Girl Guides, YMCA, YWCA, International Red cross, youth-led NGOs, Student Organisations, Community Based Organizations and development agencies focused on youth development. 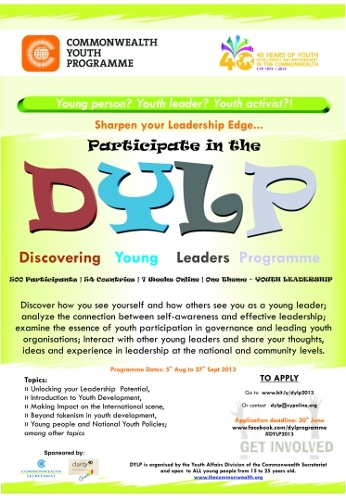 DYLP is an output-oriented programme which focuses on collective reflection on leadership among young people. It helps youth establish contacts, actively exchange and explore how they can collaborate together on projects within and across countries. i. Provide a forum for intergenerational dialogue between young leaders and youth development practitioners to build leadership capacities for young leaders through experience sharing. ii. Inspire young leaders to become ambassadors of good governance and leadership practices in their organisations and communities. iii. Create a strong and diverse base of future leaders in the Commonwealth. v. Introduce young leaders to new materials, techniques, and approaches to youth development. iii. Increased participants’ awareness of the important role they play in developing their organisations and communities. are open up to 30th June 2013. Participants should usually be young people between the age of 15 and 25 years old and can demonstrate their track record in youth leadership programmes and/ or youth work. Applicants must be able to indicate the benefit of their participation in DYLP to their communities and/or youth associations/organisations. For more information visit www.facebook.com/dylprogramme or contact [email protected]. Alternatively, contact the CYP Centre in your region. The application form can be accessed online from www.bit.ly/dylp2013. Admissions are by merit and based on the applicant’s submissions only. There are no limits to expected admissions per country.